A blast from the past. 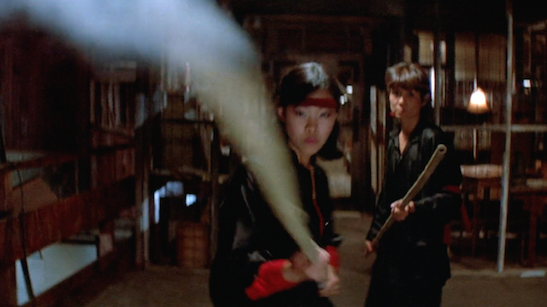 I played a Wing Kong guard in John Carpenter’s 1986 cult classic Big Trouble in Little China, starring Kurt Russell as Jack Burton, Kim Cattrall as Gracie Law, Dennis Dun as Wang Chi, James Hong as David Lo Pan, Victor Wong as Egg Shen, Kate Burton as Margo, Donald Li as Eddie Lee, Carter Wong as Thunder, Peter Kwong as Rain, James Pax as Lightning and Suzee Pai as Miao Yin. The action-adventure film set in San Francisco’s Chinatown stars Kurt Russell as a truck driver who gives a ride to a friend, and suddenly finds himself embroiled in a supernatural battle between good and evil. On Wednesday, April 8, 2015, Big Trouble in Little Tokyo is screening Big Trouble in Little China, whose title inspired that of this film series, at the Japanese American National Museum, 100 North Central Avenue, Los Angeles California 90012 at 7:00 p.m.
From the set of Big Trouble in Little China. Courtesy of 20th Century Fox. 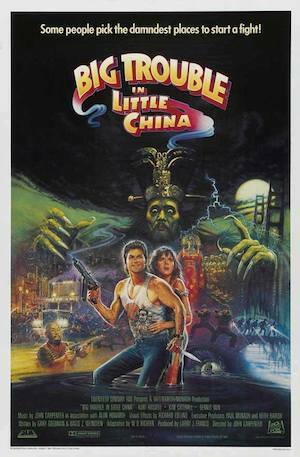 It’s going to be a mini reunion of Big Trouble in Little China cast members. I’ve been pals with Peter Kwong, who plays Rain, for a long time, but this is the first time I’ll be with Kwong and my fellow cast members George Cheung (Chang Sing #6), Al Leong (Wing Kong Hatchet Man), Gerald Okamura (Wing Kong Hatchet Man), James Hong (David Lo Pan), Jeff Imada (Needles), James Lew (Chang Sing #1), and screenwriter Gary Goldman for a Q&A which will follow the screening. If you were part of the original cast contact, Oliver Ike (213) 545-6851. After-Reception at Far Bar Little Tokyo, 347 E 1st St, LA. (cash bar). 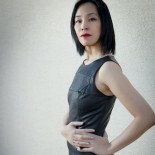 This entry was posted on March 26, 2015 by Lia Chang in Asian American Artists, Asian American Issues, Chinese American History, Entertainment, Film and tagged Al Leong, ASIAN-AMERICAN ACTORS, Backstage Pass with Lia Chang, Big Trouble in Little China, Big Trouble in Little Tokyo, Carter Wong, David Lo Pan, George Cheung, Gerald Okamura, Gracie Law, Jack Burton, James Hong, James Lew, Japanese American National Museum, Jeff Imada, John Carpenter, Kim Cattrall, Kurt Russell, Lia Chang, Lo Pan, martial arts, Peter Kwong, Victor Wong, Visual Communications, Wing Kong Guard.